This documentary shows how a canoe is built the old way. César Newashish, a 67-year-old Attikamek of the Manawan Reserve north of Montreal, uses only birchbark, cedar splints, spruce roots and gum. Building a canoe solely from the materials that the forest provides may become a lost art, even among the Native peoples whose traditional craft it is. The film is without commentary but text frames appear on the screen in Cree, French and English. Voyages of Rediscovery is an educational organization operating mostly in Washington state, using canoes and canoe-related skills as means to teach history and environmental and cultural studies. They use and build birchbark canoes and fiberglass canoes dressed up to look like birchbarks. This spring and summer they will teach birchbark canoe building to young people of the Bear Island Band of the Temagami First Nation, in Ontario. The organization is raising funds to produce a feature-length video of the project, to use for further fundraising and publicity. Their fund-raising site has a series of shorter videos, including one documenting the construction of a 25-foot bark voyageur canoe. According to G.R.G. Worcester in The Junks & Sampans of the Yangtze , "Much interest attaches to bamboo rafts in China, for here we probably have the Chinese ship in its most primitive form. From it, doubtless, evolved the various types of junks as we know them to-day." 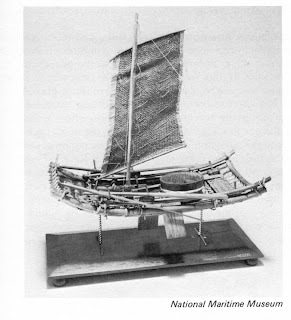 This view is confirmed by others, including Basil Greenhill, who states in Archaeology of the Boat: A New Introductory Study that the model in the photo above "shows the basic palimped shape, characteristic of all Chinese craft." 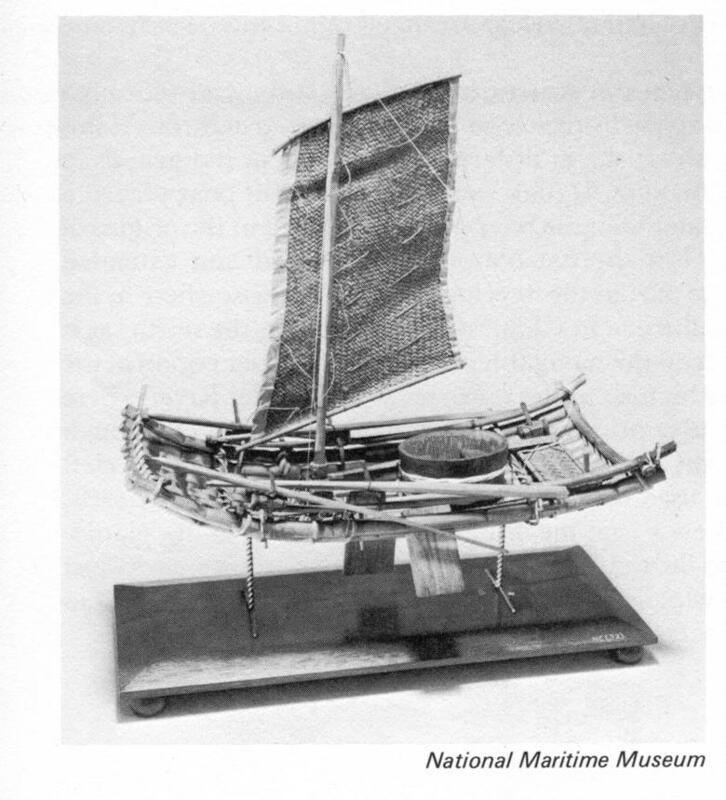 The model of the Taiwan raft shows an ocean fishing vessel. But long before the Chinese went to sea, they were doubtless using bamboo rafts for everyday transport on inland waters. The advantages of bamboo for raft building are substantial. With its sealed, hollow segments, it is far more buoyant than solid timber of equal diameter. Put another way, it is far lighter than solid timber for an equal amount of buoyancy. Not only does that make it easier to maneuver in the water, but it also makes it easier to haul out of the water at the end of a voyage, contributing to its longevity. Construction, too, is far easier: cutting down and positioning bamboo culms would be a piece of cake compared to working with logs for a comparably-sized raft. The chu-p'ai, or bamboo raft shown above was used, according to Worcester, on the lower and middle Yangtze "wherever a strong and inexpensive craft is required for work in very shallow rapids. These craft are also used as tenders to wood rafts or for ferrying passengers and cargo from place to place." The craft shown is about 30 feet LOA and a little over 5 feet wide at the bow. In addition to the visible frames, the bow is held together with a slat that passes through slots cut through the bamboo poles. Some longitudinal stiffness is provided by a kind of toe-rail along each side (#3 in the side-view). The raft was propelled by 15-foot oars worked against four tholes (#7), each about 2 feet tall. A fa-tzu, from Worcester . Click to enlarge. Please forgive the gutter between the pages, which the scan could not avoid. The fa-tzu, above, used on the Yachow River, a tributary of the Upper Yangtze, is capable of carrying cargoes of 7 tons on a platform that runs down the centerline, raising it a bit above the water that would constantly wash over the decks. Built in lengths up to 110 feet LOA, they were, according to Worcester, "the lightest draft general cargo carrier of the Yangtze, and quite possibly of the world" with a loaded draft between 3 and 6 inches. The 110-foot LOA fa-tzu shown was made from bamboos very regular in diameter, at about 5 inches. Lengths, however, were unequal, so that joints between pieces were staggered between neighboring "strakes." The slick outer surface of the bamboo is scraped off and the culm is then dried for several weeks to reduce its moisture content and weight. All fastening is done with lashings. Live fire is used to bend the culms for the upturned bow, which is help in position by a bridle (#2 in the illustration) leading to an iron bar (#4). 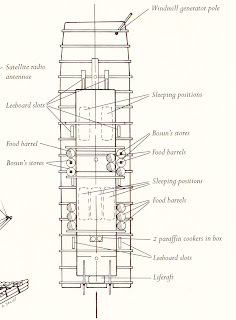 At the stern is a tiny shelter for the crew (#10), just forward of which is a brazier (#11) on which they cooked their meals. Built for very shallow water, the fa-tzu was designed to flex as it slid over rocks and shoals. When moving upstream, it was man-hauled with ropes, moving at a rate of 5-10 miles per day. Downstream, just three men worked oars against tholes (#7, 8, 9), making the 100 mile trip in 20 hours. Like his earlier book The Brendan Voyage , which we have discussed previously, Tim Severin's The China Voyage: Across the Pacific by Bamboo Raft is above all a great adventure. In it, he tells of his fascination with the legend of the Chinese navigator Hsu Fu, who, in 218 BC, set sail on a bamboo raft from China's Pacific coast heading east, and found, and possibly settled in, new lands. Lending credence to the story was the work of some well-respected modern anthropologists who theorized that South America had been settled, if not populated, by Chinese sailors on bamboo rafts. (The theory proceeds that the balsa-log rafts of South America were a local adaptation of the Chinese raftbuilding technology.) While the evidence for this pre-Colombian contact is not well-accepted, there's enough fragmentary and circumstantial evidence to lift the theory above the realm of crackpot pseudo-archaeology and make it an intriguing possibility to contemplate. Hsu Fu, from The China Voyage by Tim Severin. (Please pardon the gutter between the two pages, which I couldn't avoid when scanning.) Click to enlarge. In The China Voyage, Severin never seems to buy wholeheartedly into the theory, but he is willing enough to accept it as a possibility, to the extent of making it the motive for another of his voyages on antique boat types. If, he reasoned, he could demonstrate that a bamboo raft was capable of crossing the Pacific, then at least the theory could not be rejected on the basis of technical infeasibility. Unable to find any native builders of bamboo rafts in China in the early 1990s, he looked further afield and found the craft still being practiced in Sam Son, Vietnam. The Vietnamese rafts, however, were rather small and used for coastal fishing. 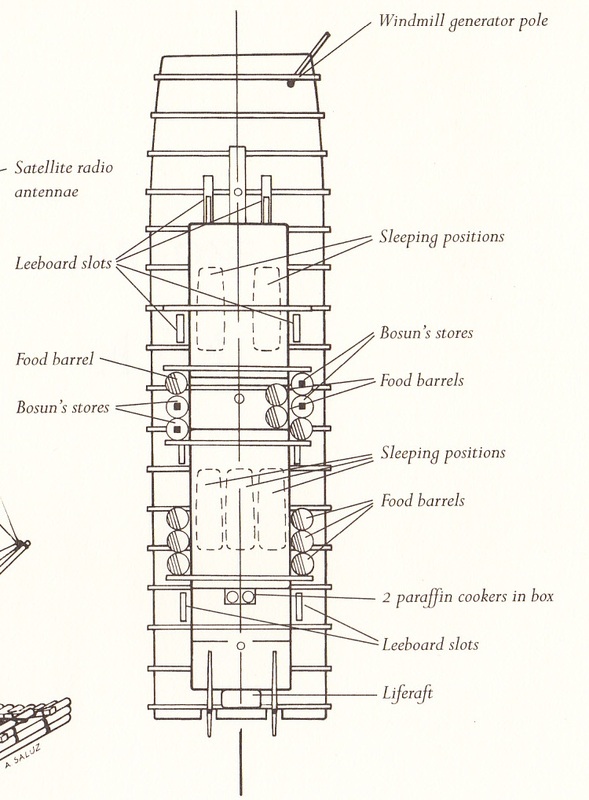 But Chinese seagoing rafts were pretty well documented by Europeans even into the 20th century, so Severin had designer Colin Mudie use what was known about them to draw plans for a raft 60 feet LOA by 15 feet in beam. Working with the Vietnamese craftsmen, Severin had them build the raft to Mudie's plans, using their own native skills. 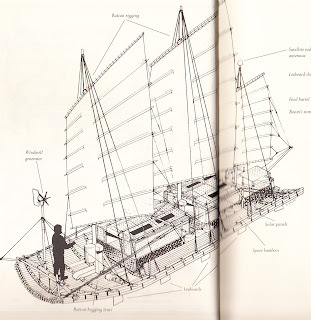 Severin's raft, which he named Hsu Fu, is shown above. The deck was composed of three layers of large-diameter bamboo, lashed together with split rattan. The bamboos were also lashed to several curved timber frames which game the boat a slight amount of deadrise. The bamboos were bent upward somewhat at the bow, helping the boat rise to waves. Rattan hogging trusses above both gunwales were intended to stiffen the structure fore-and-aft, but in fact they seem to have been largely ineffective, and they broke frequently. Deck layout of Hsu Fu. 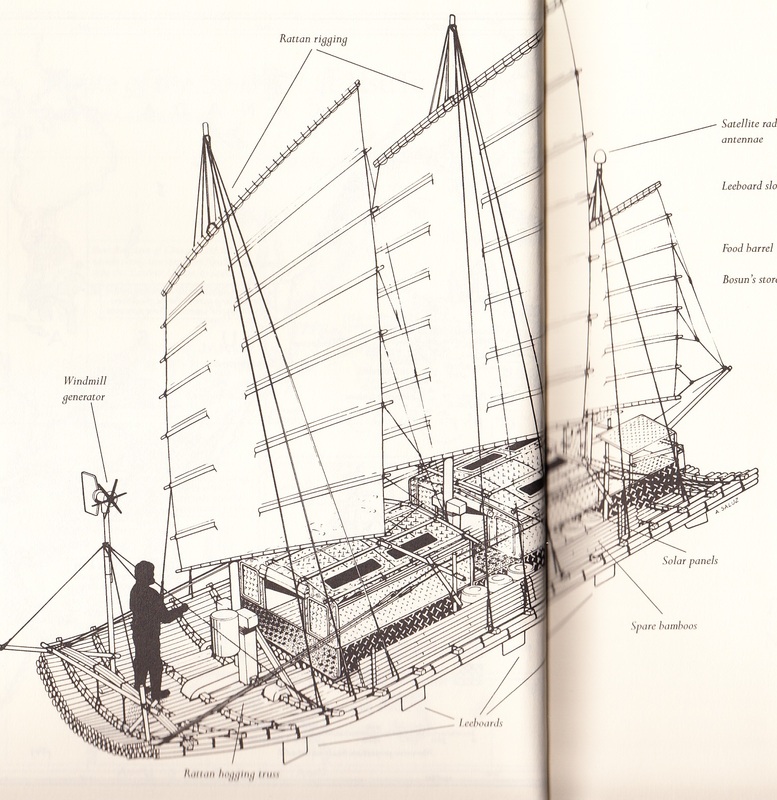 Propulsion was three Chinese lugsails, each (of course) on its own mast, totaling 800 square feet. Several daggerboards could be raised and lowered between bamboos, both to limit leeway and to alter the direction of sail by changing the center of lateral resistance. A steering oar was also used. Even so, the raft's windward sailing ability was severely limited. Severin praised Hsu Fu's seakindly motion, however, saying that it was the most stable boat he had ever sailed on. With essentially no freeboard at all, waves actually washed through the raft's structure, between the bamboos. And while this made for a constantly wet ride, it also meant that, to an extent, the vessel did not follow the surface of the sea as it sloped this way and that, but remained more nearly level instead. The structure was also flexible. With very little to stiffen it fore-and-aft, the only way that a craft made of such materials could survive was by flexing as it rode the waves. (I acknowledge that this contradicts the notion of stability as described in the previous paragraph, and this is due to my own lack of understanding. Perhaps it was the short choppy stuff that passed through the structure, while the deck conformed overall to the shapes of the swells.) The raft rode through several bad storms and, except for being constantly wet, the crew were fairly comfortable, because of the raft's easy motion. Severin, his crew and Hsu Fu traveled 5,500 miles in 105 days at sea, making it most of the way across the Pacific before the raft began to break up due to the rattan lashings rotting. (They were about 1,000 miles from landfall in the Americas when they abandoned ship to be picked up by a passing vessel.) Even so, Severin felt that the experiment was successful in demonstrating the feasibility of a bamboo raft-bound migration to the western hemisphere, noting some mitigating factors, including that his expedition began in Vietnam, which added several hundred miles to the voyage compared to the theoretical start in China. My personal conclusion is that while it wasn't great science, it was a great adventure in a well-written book. We'll look at some more Chinese bamboo rafts in the next post. Were the First Americans from Europe? Interesting article in today's New York Times outlining evidence that the Americas might have been settled by the Solutrean people of Iberia, sometime around 20,000 BC. A number of stone points and other tools have been found on the east coast, both on land and some miles out to sea, that have been indirectly but consistently dated to that time period, which is considerably earlier than most evidence for a migration via Siberia. A much larger Arctic ice cap and lower sea levels might have allowed a "coastal" voyage (i.e., along the edge of the ice cap) from Europe to North America, and the lower sea levels would explain the tools dredged up by fishing boats some miles offshore: they would have been on dry land when deposited. And so, there is speculation that the Solutrean people might have had skin-on-frame boats, and that they migrated east-to-west, living a kind of pre-Inuit maritime hunting culture and not stopping until they reached the relatively benign climate of the Chesapeake Bay. Even if this speculation is correct, it doesn't imply that the Solutreans then went on the populate the Americas. A small East Coast colony might have remained for some time and then died out, leaving the Americas again unpopulated until about 15,000 BC, when the Siberian migration took place.